Appalachian author and activist Harry Caudill published the first edition of his landmark bestseller, Night Comes to the Cumberlands, in 1963 — fifty years ago this year. He dedicated the book, "With affection and respect to my wife, Anne, without whose assistance and insistence it would never have been written and to the Kentucky coalminers whose trials and tragedies are its central theme." Anne Frye first met Harry Caudill in 1945. She was a student at the University of Kentucky at that time, and Harry had just returned to UK after being wounded in World War II. After a brief courtship, they became engaged, then married in 1946. It was a perfect match and, as history has proven, a perfect partnership. 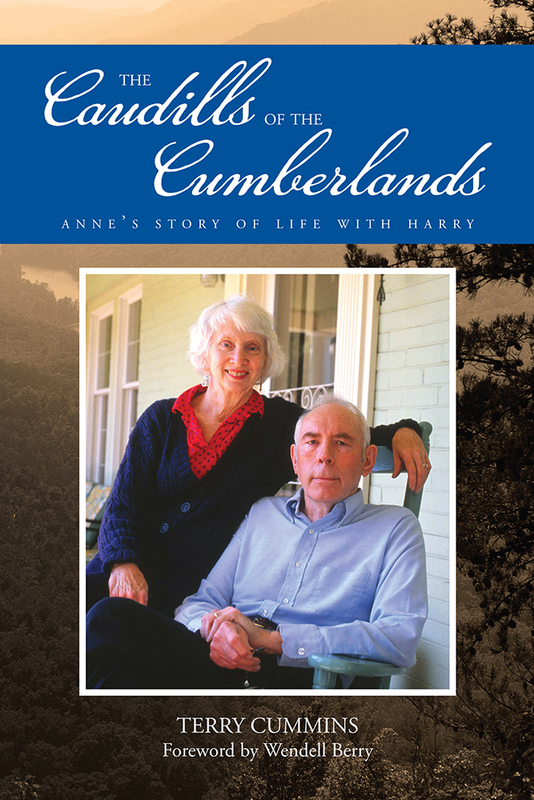 After the Caudills moved to Whitesburg, Kentucky — Harry's hometown — Harry practiced law and, with Anne's assistance, wrote 10 books. Night Comes to the Cumberlands attracted world-wide attention when it was published. Thousands of visitors, including government officials, journalists, members of the media, historians, volunteers and curious individuals from all over the world traveled to Appalachia to see what "night" had wrought. Many of those visitors actually stayed in the Caudills' home — and while they were there, they swapped stories with their hosts. Harry was a renowned storyteller, and so is Anne. In this heartwarming memoir, The Caudills of the Cumberlands: Anne's Story of Life with Harry, Anne Caudill — at age 89 — tells author Terry Cummins fascinating and incredible stories from her life with Harry in Appalachia. She recalls historic visits by famous people, memorable moments with family and friends, and shares captivating accounts of regional legends and lore. Most importantly, this delightful collection of Anne's personal recollections reveals the depth of the relationship she shared with Harry, her partner in love and in life for nearly 44 years: "I never remember a day that Harry didn't kiss me and tell me he loved me." Terry Cummins was born in the hills of Pendleton County, Kentucky, in the house his great-grandfather built. He grew up on this family farm, which is about 20 miles from where Anne Frye Caudill grew up; both have similar rural backgrounds. Cummins has a bachelor of arts degree from Transylvania University and a master of arts from the University of Kentucky. After two years in the US Navy, he started a career in education — two years as an English and physical education teacher — followed by 31 years in administration, primarily as a high school principal in Kentucky and southern Indiana. After he retired, Cummins began a second life following Helen Keller's creed that "Life is an adventure or nothing." His adventures include running marathons, climbing mountains, trekking through many parts of the world, and his compulsion — writing. He ran his first marathon at age 63, climbed his first mountain on his 64th birthday and reached the summit of a 20,000-foot peak three days later. He published his first of more than 625 articles at age 66, and published his first of five books at age 69. Cummins traveled through Siberia and trekked above the base camp at both the north and south faces of Mt. Everest. He is the oldest person to reach the advanced base camp at K2, the second tallest mountain in the world. He lived in India for a month, climbed mountains in the Andes in South America, and recently hiked through part of Patagonia. His previous books include Feed My Sheep, How Did Back Then Become Right Now, Briny's Gift, and Retirement Is a Blast Once You Light the Fuse. Cummins has been married to his wife, Vera, for nearly 60 years. They have four children, five grandchildren, and two great-grandchildren.